Sometimes you just want something crunchy, or you want something to spread your favorite dip on rather than just eat it with a spoon. This is one of the banes of low carb/paleo existence. 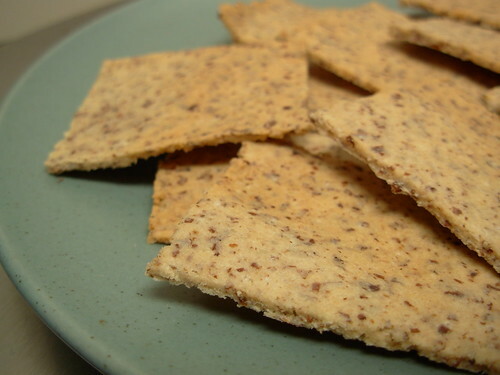 Luckily, it's dead easy to whip up some almond crackers to satisfy on both counts! You can enjoy them as is or use them as vehicles for other tasty food such as guacamole or pate. You could even make them into dessert by adding some cinnamon or pie spice to the dough and perhaps a touch of honey or maple syrup. Line a cookie sheet with parchment paper. Make sure you use parchment paper, because if you don't you'll end up chipping your crackers out of the pan. Place the dough in the middle and top with another piece of parchment paper. Using a rolling pin (or any other cylindrical instrument), roll out the dough as thin as you can get it. Try to make it take up the whole cookie sheet if you can. Super thin. I mean it! Peel off the top layer of paper and score the dough with a knife into whatever size crackers you want. Bake in the 325 oven for 10 minutes and then check on the crackers. You are looking for them to color ever so slightly. A little color means crispy, but a lot of color means burned nut taste, which is no good. If the edges have started to color nicely, remove them to a plate and put the remaining crackers back in the oven. Keep doing this, checking every 5 minutes and removing the golden crackers, until finally they are all baked to perfection. Ok, I know it's not much of an excuse, but I haven't been posting because I lost my camera. Again. I visited my family and left my camera in the back of my mom's car. I just don't like doing blog posts without pictures! They're the best part! I've also been experimenting with a very high fat/very moderate protein diet (The Optimal Diet by Dr. Jan Kwasniewski, aka "Polish Atkins") and I've been eating dairy for the past two weeks, so you probably didn't want to hear about what I was eating anyway. ;) I think my experiment with that is over...I did lose a pound or two, but I forgot how oogy dairy makes me feel. Anyway, here is a nice dinner you can make. The recipe is just a loose guideline; this is really a dish you just want to feel out. I love watching Daisy Martinez's cooking show on PBS, and I kind of made this up based on general principles from her style of Puerto Rican cooking. 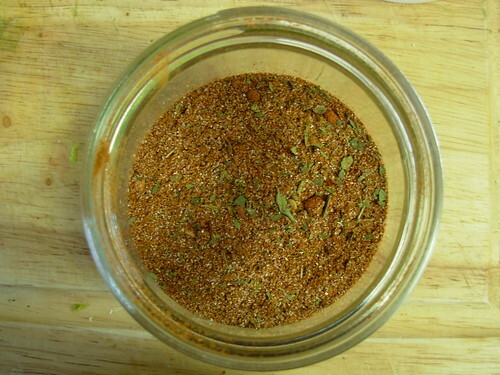 First of all, you have to make Daisy's sofrito and her achiote oil, which you can find here http://www.daisycooks.com/pages/recipes_detail.cfm?ID=1 and here http://www.daisycooks.com/pages/recipes_detail.cfm?ID=2 Sofrito is a wonderful fresh sauce/condiment made out of onions, peppers, tomatoes, garlic, cilantro, etc. The recipe makes a ton, but it freezes well. Achiote oil is just extra virgin olive oil gently warmed with annatto seeds until it becomes a deep amber color and picks up the flavor of the seeds. Puerto Rican cooking would traditionally use rice as the base for this dish (arroz con pollo), but since this is paleo we're talking about here, I used a base of shredded kale instead. I just used one bunch of dino kale cut very finely. Heat 2 T achiote oil, salt and pepper the chicken, and brown well on all sides. Remove the chicken from the pan. Reduce the heat to medium and add the sofrito to the pan, deglazing with the juices. Add the remaining 2 T achiote oil and let the liquid cook off until the sofrito starts to sizzle. Add in some olive salad and capers to taste and a little of the olive salad liquid. Add the kale to the pan and stir to coat. 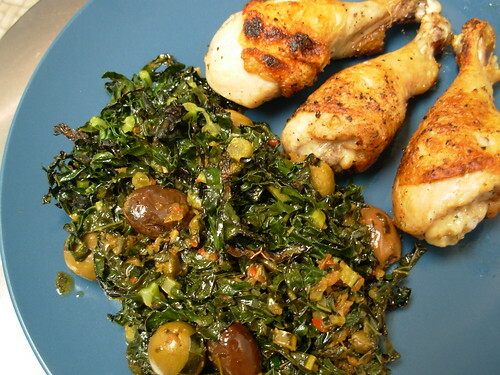 Nestle the chicken on top of the kale, put a lid on the pan, lower the heat, and cook for 10 minutes. In the last 5 minutes of cooking, heat the broiler up. Once the chicken and kale has steamed for 10 minutes, put the whole pan under the broiler for 4-5 minutes to crisp the skin up. My husband declared this the best chicken I've ever made. Hopefully it has inspired you to make something delicious with sofrito as well! I had been threatening to do it for weeks, and I finally did it. 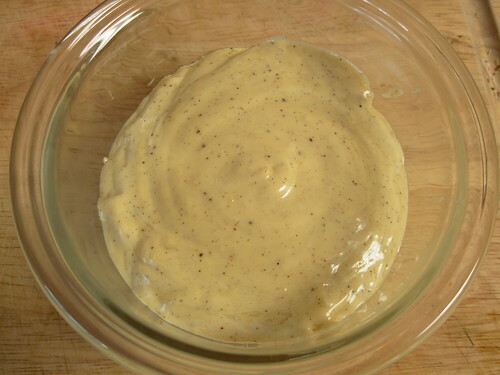 I took my leftover bacon grease and turned it into mayonnaise. I love mayonnaise, but I hardly ever eat it anymore because it's impossible to find a commercial brand that isn't made with a bad vegetable oil. I don't like homemade mayo made with extra virgin olive oil as it tastes far too strong. Light olive oil makes a palatable mayo, but light olive oil has undergone some pretty severe processing, making it not ideal either. Enter the bacon fat! I didn't bother to strain my drippings which is why my mayonnaise is speckled, but the taste is still outrageously good. :) I'm not going to try to tell you how to make this stuff, because it's pretty finicky, so I'll direct you to the original recipe I used, which you can find here: http://bitten.blogs.nytimes.com/2008/08/25/introducing-a-recipe-contest-with-prizes/ The original comes from a book called simply "Fat" by Jennifer McLagan. I had to go through some calisthenics to get mine to turn out. I started it in a food processor, but there was so little volume from one egg yolk that it wouldn't reach the blades. So I had to scrape everything into a blender. Then I had to add another egg yolk to get a good emulsion going. Then I had to add more lemon juice to cut through the extreme savoriness of the bacon. The end product is delightful though. :) I think I'm going to make chicken salad with it. Taco night is one of my favorite nights. :) I love setting out all the different fixins in their little bowls and letting everyone go down the line and construct their own. Since I have yet to find a paleo version of a tortilla, I usually just do taco salad now. Big bed of lettuce, big scoop of taco meat, and then pile on the condiments. Cheese, sour cream and refried beans are out, so instead I set out things like guacamole, chopped tomatoes, chopped scallions, salsa, hot sauce, lime wedges, chopped cilantro, olives, even crumbled bacon (is there anything that doesn't go with bacon?). The most problematic element in this equation is the taco meat. Those little premade packets of taco seasoning that you can get at the store are full of fillers and salt. Luckily, it's dead easy to make your own. Recipe is adapted from 500 Low Carb Recipes by Dana Carpender. Drive-by posting today. I had a very busy, yet fun, weekend getting together with my old high school crew who I hadn't seen in years. 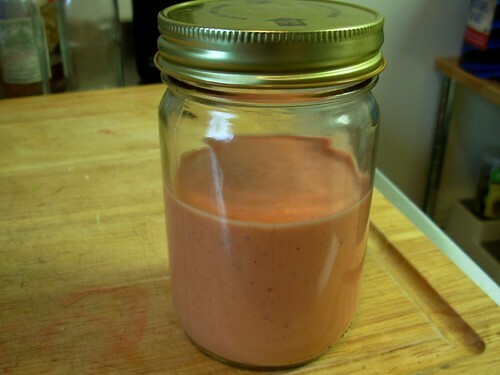 Getting back on track this week starting out with this interesting Strawberry Vinaigrette salad dressing I made today. It's so good it's making me look forward to salad this week!